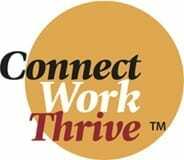 Connect•Work•Thrive Helps You Find Work You Love! Our career and industry experts empower you with critical skills and an amazing network to find your next wonderful opportunity. We have helped hundreds of professionals change careers and return to the workforce after a career break. — all brimming with up-to-the-minute expertise to get you where you want to be. Employers from a plethora of industries tap into the Connect•Work•Thrive Community — high tech, financial services, health care, education, media, the arts, nonprofits — the possibilities are endless. Take the fast track to your career change!